【NATURAL COLORANTS, HEALTHY】Extracted from herbs of Henna, Ginseng, Wheat Oil, Vitamin, Soybean etc. by nanotechnology for hair color and scalp nutrition, the plant-based, water-soluble ingredients keep hair soft, smooth and well-nourished, like natural hair. After long use, hair condition will be improved, some even restore to black. 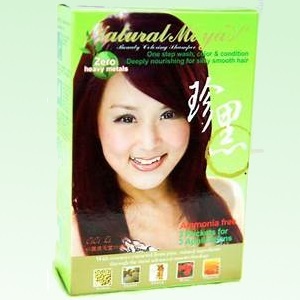 【PENETRATIVE COLORING & LONG-LASTING】Unlike chemical color to wrap hair and suffocate hair breath, which lead hair to pale, dry & brittle, Natural Mi Ya uses advanced color blending techniques & cutting-edge technology to open up the hair cuticles, allowing for longer-lasting color and fast absorption of hair colorant and vital micro-nutrients, which remains hair alive, energetic. 【IDEAL COLORING EFFECTS】Due to herbs colorant, you can make your hair a little darker by coloring longer. You also can blend different colors to produce special effect, i.e. blending chestnut & brown to produce a brown hair with slight red. 【GINSENG FLAVOR】Ginseng flavor is left slightly when coloring, pleasant and mild, unlike irritating chemical odor. But Ginseng sensitive users are not recommended. 【SAFETY & VACUUM PACKAGE】Pass SGS test, zero heavy metals, no ammonia, no cancer-causing ingredients. Vacuum Packaged liquid packets are convenient to use & stock.